If one tournament sums up how the 2011 World Series of Poker has gone this year, it would be the $1,500 buy-in No-Limit Hold’em Shootout, which was just completed at the Rio in Las Vegas. Four former WSOP gold bracelet winners, with six combined career wins amongst them, sat down at the final table, each with shared visions of winning yet another WSOP title and throwing down the gauntlet on the flurry of first-time winners who have seemingly overpopulated this year’s tournament leader boards. Looking at the formidable lineup of savvy bronzed and bejeweled veterans – which included Erik Cajelais, Dan Kelly, Vitaly Lunkin, and David Pham (all with combined $6.5 million in WSOP winnings) one might have expected a late-night star-stacked battle, and perhaps a repeat champion. But the five lesser-known players had other ideas. One by one, the giants of WSOP yesteryear fell like wilting timber, thereby allowing yet another shiny new WSOP gold bracelet to be snatched up by a newcomer. It all started just moments after final table play began when David Pham went down in ninth place. Then, Vitaly Lunkin hit the rail, finishing seventh. Then, it was Dan Kelly’s turn to exit in sixth place. Finally, Erik Cajelais was sweep away like morning garbage as the fifth-place finisher. All of the remaining four were players who had never previously won anything resembling a gold bracelet. Ultimately, Andrew Badecker triumphed in the changing of the guard, thus becoming the 13th-consecutive first-time gold bracelet winner at this year’s WSOP. He initially won two full-table matches and then obliterated a tough final table lineup, en route to his first WSOP victory. Badecker is a 23-year-old poker pro, who now resides in Las Vegas. He recently moved from Connecticut, where he grew up. Badecker dropped out of Southern Connecticut State University in order to try playing full-time and now has the bankroll to follow his poker dreams. He earned $369,371 in prize money, plus the most coveted prize in poker – the WSOP gold bracelet. The three-day tournament began on Wednesday and ended late past midnight very early on Saturday morning. The field-size of 1,440 players represented one of the largest Shootout fields in poker history. The top 160 finishers collected prize money. Several former WSOP gold bracelet winners cashed in this event – including those who made it to the final table. They were officially listed as Amir Lehavot (21st), Eric Baldwin (42nd), Scott Montgomery (46th), Blair Hinkle (56th), Daniel Negreanu (59th), Max Pescatori (64th), Brandon Cantu (82nd), Scott Seiver (97th), Greg Raymer (109th), Jennifer Tilly (131st) and Matt Matros (133rd). Shootouts emphasize short-handed poker skills. This generally requires competitors to play cards out of the standard range of starting-hand requirements. It also makes post-flop skill paramount to victory. In a sense, each round is a “final table” for all the competitors since the objective is to accumulate chips and eliminate opponents. A shootout tournament means players advance based on winning a series of table matches. The shootout format is single elimination. The number of matches depends on the number of tournament entries. In this event, the winner was required to win each in a series of consecutive matches. The first match included nine players. The second match included 10 players. The last day included two tables of 16 players playing down to the winner. As for explanations as to why so many relatively-unknown players are crashing the big WSOP party this year, here's one plausible theory. Perhaps the influx of stellar talent that has descended upon Las Vegas was caused by the events of what has been called "Black Friday." Thinking about it, everything makes perfect sense. Perhaps the next 45 or so events will ultimately determine if this is merely an anomaly. The old guard surely hopes so. But what is more likely is the reality that this is indeed the dawning of a new era and age in high-stakes tournament poker when an entire generation of young super-skilled twenty-somethings are stepping out of the shadows of the online world for the first time and stepping into the luminescence of the bright lights at the WSOP. And as the beam of light grows brighter with each passing tournament winner, this new crop is being exposed for what it is – superior talent. For a list of all players who cashed, in Event #13 and all the tournament details, click HERE. The 2011 World Series of Poker $1,500 buy-in No-Limit Hold’em Shootout champion is Andre Badecker, from Vernon, CT.
Badecker was born in Vernon, CT.
Badecker recently moved to Las Vegas. He was expecting to stay for the summer. At the time of his move, he was not sure he would stay permanently. His decision would ultimately depend on how he did in poker. Perhaps that decision is now a bit easier for Badecker. Badecker attended Southern Connecticut State University. He went to school for about a year and a half, but did not graduate. Badecker has played at the WSOP during each of the last three years. This was his fourth time to cash. Badecker collected a $369,371 for first place. He was also awarded his first WSOP gold bracelet. According to official records, Badecker now has 1 win, 1 final table appearance, and 4 in-the-money finishes at the WSOP. Badecker currently has $381,029 in career WSOP winnings. Badecker is to be regarded as a poker pro, since he has been playing full-time for about five years. The official final table was comprised nine players. The final table contained four former gold bracelet winners – David Pham (2 wins), Vitaly Lunkin (2 wins), Erik Cajelais (1 win) and Dan Kelly (1 win). This was the most bracelet-laden finale of any table played to date, with six combined WSOP title victories. Pham won this same event in 2006, although the buy-in was $2,000 at the time. The four former winners did not fare well. The highest finish of the group was a fifth-place finish by Erik Cajelais. Six different nations were represented at the final table, making this one of the most international gatherings of any finale played thus far. Players represented the following countries – Canada (1 player), Gibraltar (1 player), Great Britain (1 player), Israel (1 player), Russia (1 player), and the United States (4 players). The runner up was Robbie Verspui, from Gibraltar. He collected a nice consolation prize amounting to $228,334. Verspui’s finish in this tournament is the highest in history by any player from the small British-supervised territory of Gibraltar. The third-place finisher was Daniel Makowsky, from Tel Aviv, Israel. He is a multi-tournament table specialist, who has been playing online poker for some time. Makowsky now has nine WSOP cashes and more than $700,000 in career earnings. The fourth-place finisher was Jonathan Spinks, from Exeter, UK. He became only the second player so far at this year’s WSOP to make two final table appearances. Eddie Blumenthal was the first. Spinks now has two fourth-place finishes – one in this event plus a similar showing in the $1,500 buy-in Seven-Card Stud competition. The fifth-place finisher was Erik Cajelais, from Terrebonne, Quebec (Canada). He won the Mixed Pot-Limit Championship last year, held at WSOP Europe in London. The sixth-place finisher was Dan Kelly, from Potomac, MD. He is a 22-year-old poker pro and a graduate of Villanova University. Kelly won the $25,000 buy-in Six-Handed No-Limit Hold’em Championship, last year – good for $1,315,518. Kelly is proving to be one of the game’s best young players. This marked Kelly’s second cash this year (a 6th and an 11th). He now has six WSOP cashes in just the last two years. The seventh-place finisher was Vitaly Lunkin, from Moscow, Russia. He is a 40-year-old poker pro. Lunkin hoped to become the second Russian champion this year, but came up short. Lunkin’s two previous wins were in 2008 ($1,500 buy-in No-Limit Hold’em) and 2009 ($40,000 buy-in No-Limit Hold’em). He now has 15 cashes and nearly $3.5 million in WSOP winnings. The eighth-place finisher was Joseph Webber, from Bryan, OH. He is a 42-year-old engineer. This was his second time to cash at the WSOP. The ninth-place finisher was David “the Dragon” Pham, from Cerritos, CA. He is a 44-year-old poker pro. Pham won his first WSOP title in 2001 ($2,000 buy-in S.H.O.E.). His second win took place in this same event, held in 2006. Final table play began at 5:45 pm on Friday. Play ended at 12:30 am. The finale went about 6 hours and 45 minutes. The final table was played on ESPN’s main stage. The final table areas are getting raves in terms of design and appearance. No stage in the history of poker has ever looked as spectacular. Early reports from the television crew are that this year’s preliminary footage looks “spectacular.” Viewers will be able to see ESPN’s coverage again once the WSOP Main Event begins. Action was streamed live over WSOP.com. Viewers can tune in and watch most of this year’s final tables. Although hole cards are not shown, viewers can follow an overhead camera as well as a pan-shot of the table. The floor announcer provides an official account of the action. The top 160 finishers collected prize money. The defending champion was Steven Kelly. He did not cash this year. Several former WSOP gold bracelet winners cashed in this event – including Erik Cajelais (5th), Dan Kelly (6th), Vitaly Lunkin (7th), David Pham (9th), Frank Kasella (13th), Amir Lehavot 21st), Eric Baldwin (42nd), Scott Montgomery (46th), Blair Hinkle (56th), Daniel Negreanu (59th), Max Pescatori (64th), Brandon Cantu (82nd), Scott Seiver (97th), Greg Raymer (109th), Jennifer Tilly (131st) and Matt Matros (133rd). Note that “official” places are not necessarily representative of actual order, since this tournament was a Shootout format. British player Andrew Pantling is enjoying a very strong run in the most recent WSOP events. Dating back to WSOP Europe (played in London, last year), he now has three top 12 finishes in the last 18 gold bracelet events that have been held. He took 12th place in this event. 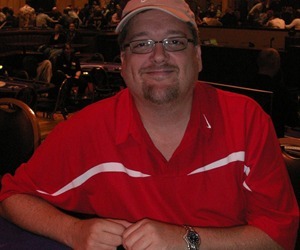 This was 2004 WSOP champion Greg “Fossilman” Raymer’s eighth consecutive year to cash in at least one WSOP event. Last year’s WSOP “Player of the Year” Frank Kassela enjoyed his first cash in 2011 with this 13th-place finish. Kassela won two gold bracelets last year. Amir Lehavot, who won the $10,000 buy-in Pot-Limit Hold’em World Championship three days earlier, cashed in 21st place. Former gold bracelet winner and actress Jennifer Tilly cashed in this tournament and now has two cashes so far this year. Italian pro Filippo Candio, who finished fourth in last year’s WSOP Main Event Championship (good for $3,092,545), cashed for the first time this year. Tournament results are to be included in the WSOP official records. Results are also to be included in the 2011 WSOP “Player of the Year” race. “Player of the Year” standings can be found at WSOP.com HERE. This is the 906th gold bracelet awarded in World Series of Poker history. This figure includes every official WSOP event ever played, including tournaments during the early years when there were no actual gold bracelets awarded. It also includes the 16 gold bracelets awarded to date at WSOP Europe (2007-2010). Moreover for the first time ever, one gold bracelet was awarded for this year’s winner of the WSOP Circuit National Championship. The official WSOP gold bracelet ceremony takes place on the day following the winner’s victory (or some hours later when the tournament ends very late). The ceremony takes place inside The Pavilion, which is the expansive main tournament room hosting all noon starts this year. The ceremony begins at the conclusion of the first break of the noon tournament. The ceremony usually starts around 2:20 pm. The national anthem of the winner’s nation is played. The entire presentation is open to the public and media. Video and photography is permitted by both the public and members of the media. Badecker’s gold bracelet ceremony is set to take place on Saturday, June 11th. The national anthem of the U.S.A. will be played in honor of his victory. Shootouts debuted at the 2002 WSOP. 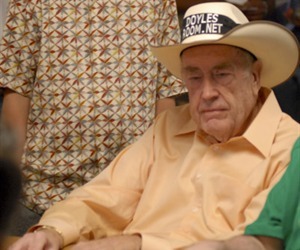 Both Limit and No-Limit Hold’em events have been offered every year since 2004. There have been two No-Limit events held each year, since 2009. The Shootout format gains popularity every year. 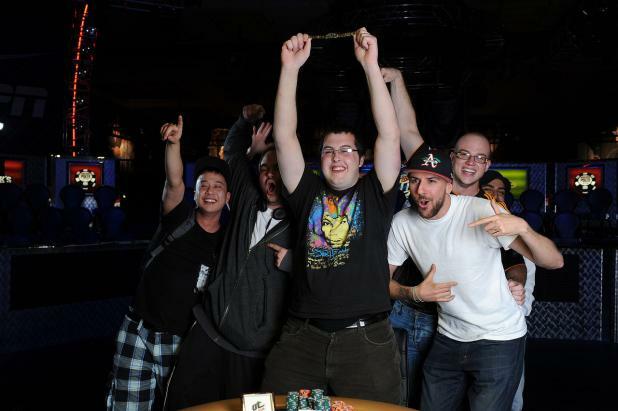 The first-ever WSOP Shootout champion was Joel Chaseman. A shootout tournament means players advance based on winning a series of table matches. The shootout format is single elimination. The number of matches depends on the number of tournament entries. In this event, the winner was required to win each in a series of consecutive matches – usually no more than three or four. Each match is played like a single-table satellite, with only one winner from each table. The tournament was played over three consecutive days. Day One began with 1,440 players. There were 160 matches played – with nine players starting at each table. At the conclusion of Day One, 160 players (all the winners) advanced to Day Two. Day Two resumed with 160 players. There were 16 (10-handed) matches played, with 10 players starting at each table. At the end of Day Two, 16 players (all the winners) advanced to Day Three. Day Three began with the 16 players playing down to a final table of nine. Then, the final table played down to the winner. The tournament officially began on Wednesday, June 8th at noon. The tournament officially ended on Friday, June 10th, at 12:45 am. Through the conclusion of Event #13, the 2011 WSOP has attracted 13,504 entries. $25,835,800 in prize money has been awarded to winners, so far. All of the first 13 tournaments completed so far have been won by first-time champions (non-winners from previous years). Five of the first 13 winners this year also enjoyed their first-ever WSOP cash with their victory. Every WSOP over the past 11 years has included at least one multiple gold bracelet champion (wins within the same year). 1999 was the last year the WSOP was comprised exclusively of single-event winners. The record for most multiple gold bracelet winners in a single year was in 2009, when five players managed to win two or more titles. The streak of male WSOP gold bracelet winners has now reached 175 consecutive events. Aside from the annual Ladies Championship, the last female player to win a WSOP tournament open to both sexes was Vanessa Selbst, in 2008. The longest cold streak for female players occurred between years 1982 and 1996, when 221 consecutive open events passed without a female champion. The highest finish by a female player (open events) at this year’s WSOP was Maria Ho, who finished second ($5,000 buy-in No-Limit Hold’em). Note: Various categories and statistics will be updated with each gold bracelet event as they are completed.